Many of these varied parcels of old fable were collected and compiled in manuscripts (comprising Old Norse texts), in circa 13th century Iceland. One of these important Old Norse works of literature pertains to the Prose Edda, assumed to be written by the Icelandic scholar and historian Snorri Sturluson, circa 1220 AD. The other crucial literary work composed in Old Norse relates to the Poetic Edda. As its name suggests, the compilation consists of poems dating from circa 1000 – 1300 AD, with most of the collections (and their variant versions) containing text from the Codex Regius (Royal Book), an Icelandic medieval manuscript dating from circa 1270 AD. The Codex Regius in itself is considered as one of the most important extant sources for both Norse mythology and Germanic legends. One of the best examples of these medieval influence on Norse mythology relates to the narrative of the Æsir–Vanir War, whereby two different pantheons (representing the Æsir and Vanir tribes of Norse gods) are merged into a singular literary scope. So without further ado, let us take a gander at 12 Norse gods and goddesses you should know about. 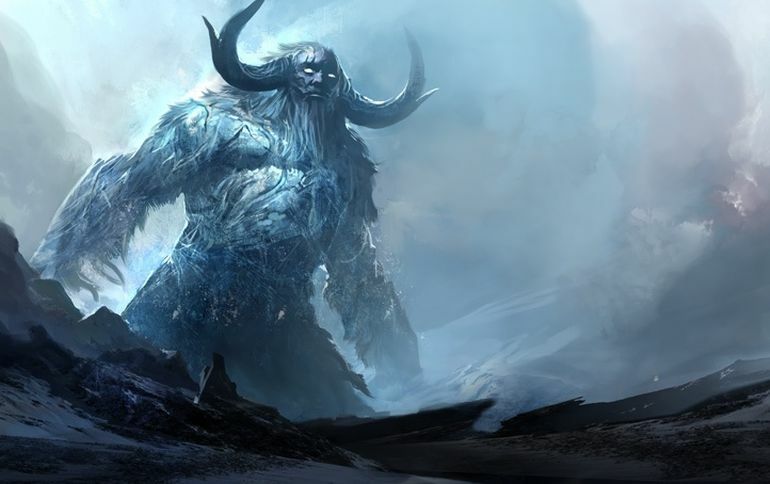 Like with most mythologies, including Mesopotamian and Egyptian, the Norse pantheon had its primeval entity in the form of Ymir, the ancestor of all jötnar (mythic entities that ranged from giants to other fantastical creatures). Now as opposed to a strict categorization as one of the Norse gods, Ymir was perceived more as the ‘first being’ who was created by the ice of Niflheim combined with the heat of Muspelheim, long before the existence of the Earth. And after his own genesis, Ymir, with his hermaphroditic body, was responsible for birthing male, female, and other mythical beings, who in turn would go on to bear future generations. And mirroring other primeval deities of ancient mythologies, the narrative of Ymir took a turn, with the entity being given a tragic ending due to his apparent evil machinations. To that end, Buri (created after Ymir), often acknowledged as the first of the Norse gods, had a son named Bor, who finally married one of Ymir’s descendants Bestla, and their union produced three sons – Ve, Vili, and Odin. But the angry Ymir confronted these ascending young Norse gods, which eventually led to his own death at the hands of the three brothers. The three Norse gods, including Odin, then proceeded on to create the entire earth from Ymir’s fallen body, with his blood accounting for the seas and oceans, while his bones made up the rocks and mountains. Furthermore, his hair was used for the trees, his skull was transformed into the sky and heavens, and his brains were made into clouds. And finally, his eyebrows were fashioned into the Midgard – the ‘middle realm’ of mankind. Odin (Óðinn in Old Norse), possibly the most revered yet enigmatic of all Norse gods, was regarded as the king of the Æsir tribe of gods. Historically, Odin had always been prominent in the pantheon of Germanic mythology, as is evident from Tacitus’ late 1st-century AD work Germania (where Odin is seen as the equivalent of Roman god Mercury). And given his mythical eminence over the cultural framework of the Germanic people, Odin was associated with various (and often antithetical) aspects, ranging from wisdom, healing, royalty to death, sorcery, and even frenzy. Pertaining to the attribute of wisdom, the character of Odin mirroring his ‘contradictory’ aspects, was often portrayed as the haggard wanderer who relentlessly seeks knowledge, in spite of his regal status as the ruler of the Asgard. One of the stories epitomizes the god’s thirst for knowledge and wisdom where Odin willingly gouges out one of his eyes as a sacrifice for Mimir, a shadowy being who possesses unparalleled knowledge because of its consumption of the water from the Well of Urd. Mimir in return offers Odin a draught from the well that draws water from the roots of the Yggdrasil, the cosmic tree that binds the nine worlds of Norse mythology. On the other hand, the one-eyed Odin also has a sinister (albeit in a nascent level) side to him, given the entity’s proclivity for provocation that leads to conflicts and wars. Essentially, when perceived as a war-god, Odin was seen as the epitome of battle frenzy and chaos – aspects that were favored by the warlords and berserkers. 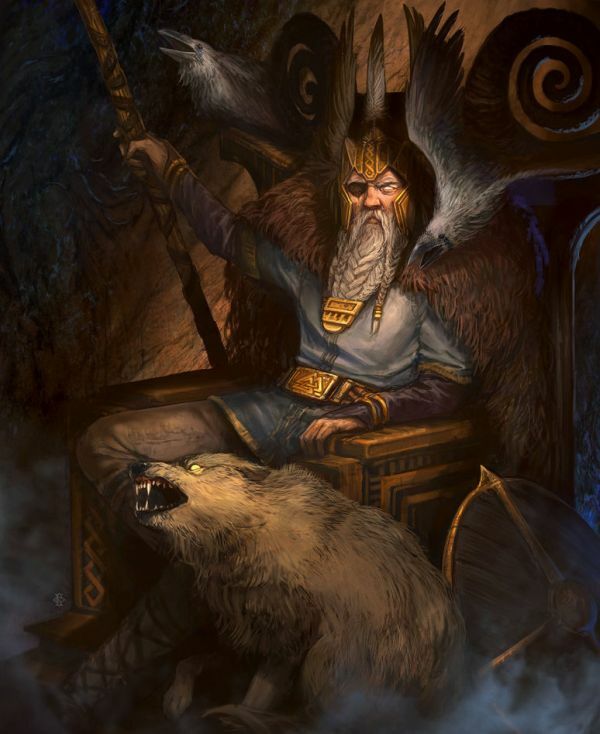 In any case, in our modern day context, the name of Odin is related to Wednesday, since the word is derived from wodnesdæg (“Woden’s Day”), with Odin being referred to as Wōden in Old English and Wōtan in Old High German. 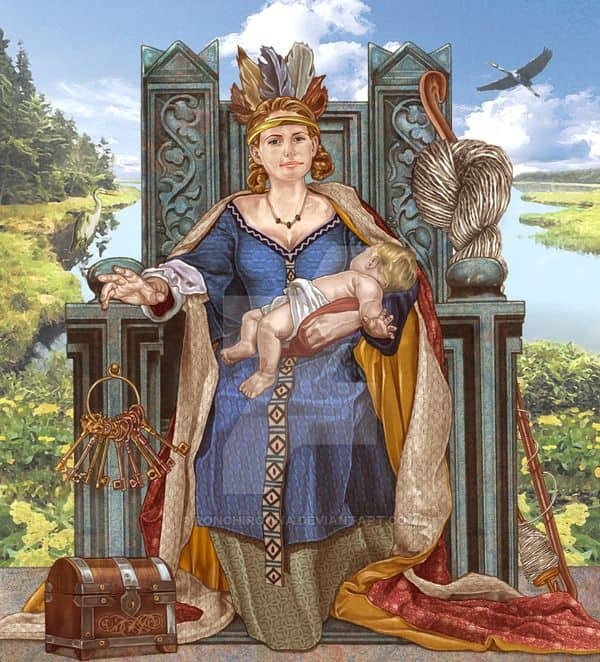 Possibly the foremost of all Norse goddesses when it came to their pantheon, Frigg was regarded as the Queen of the Æsir and the goddess of the sky. Moreover, with her special status as the spouse of Odin, the deity, with her power of foreknowledge, was also frequently associated with fertility, household, motherhood, marriage, and even domestic matters. In essence, of all the Norse gods, it was the mythic aspects of Frigg that were mostly related to the perceived bliss of family life. The problem of whether Frigg or Freyja may have been a single goddess originally is a difficult one, made more so by the scantiness of pre-Viking Age references to Germanic goddesses, and the diverse quality of the sources. The best that can be done is to survey the arguments for and against their identity, and to see how well each can be supported. 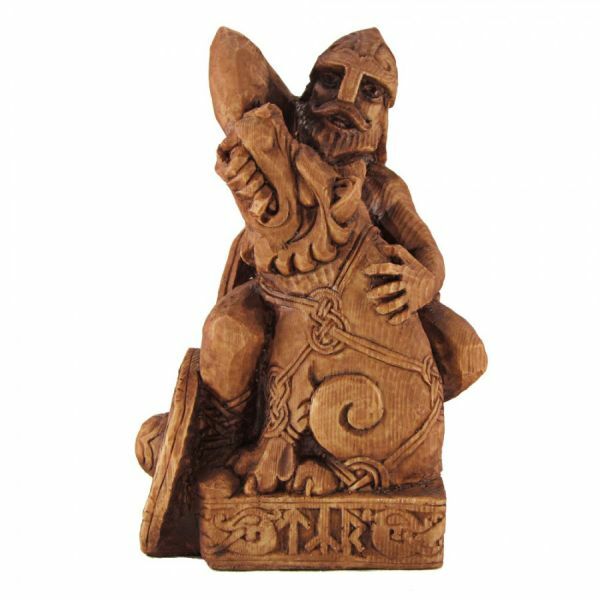 Arguably the most famous of the Norse gods, Thor (Þórr in Old Norse), the god of thunder, with his burly might and boisterous ways, epitomized the formidable warrior who was accorded high status in the Germanic society of ancient and early medieval times. 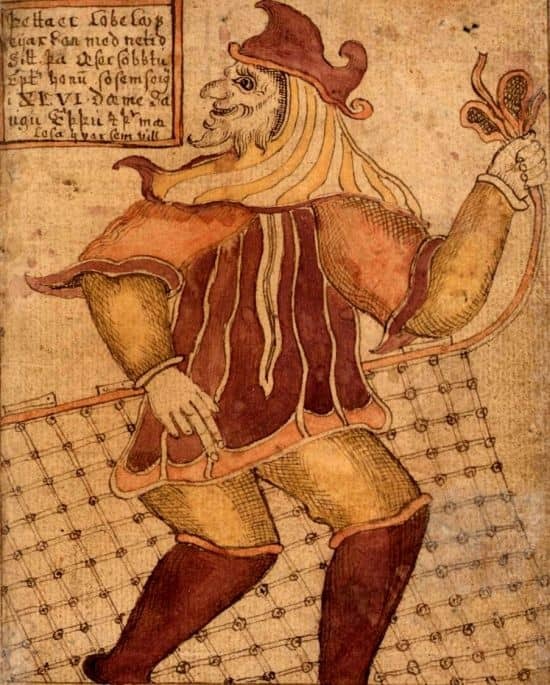 Regarded as the son of Odin and his wife Fjörgyn (not to be confused with Frigg), Thor, with his red beard and eyes, was hailed as the loyal and stalwart defender of the Æsir’s stronghold of Asgard, thus suggesting his symbolic role as the protector of the ordered cosmos. Suffice it to say, according to Poetic Edda, Thor was considered as the strongest of all beings among both gods and men. And his strength was rather ‘amplified’ by some of his specially-crafted apparels, including his iron gloves and the belt of Megingjard (or megingjarðar in Old Norse). But the most common item associated with Thor undoubtedly pertains to the dwarf-crafted hammer Mjöllnir (roughly translated to ‘lightning’), thus alluding to how thunder was perceived (by the pre-Christianity era Norsemen) as the result of Thor striking his hammer, presumably when slaying giants and monsters while riding his chariot drawn by two giant goats – Tanngniost and Tanngrisnir. Interestingly enough, Thor was also regarded as the god of agriculture, fertility, and hallowing. Pertaining to the former, this aspect was probably an extension of Thor’s role as a sky god who was also responsible for rain. To that end, Thor’s wife Sif and her golden hair possibly symbolized the fields of grain, and thus their union embodied the fruitfulness and verdancy of the lands. As for our modern context, ‘Thursday’ is derived from Old English þurresdæg, a contraction (possibly influenced by Old Norse þorsdagr) of þunresdæg, which literally means “Thor’s day”. There is nothing but good to be told of him. He is the best of them and everyone sings his praises. He is so fair of face and bright that a splendor radiates from him, and there is a flower so white that it is likened to Balder’s brow; it is the whitest of all flowers. From that, you can tell how beautiful his body is, and how bright his hair. He is the wisest of gods, and the sweetest-spoken, and the most merciful, but it is a characteristic of his that once he has pronounced a judgment it can never be altered. Balder also possessed the greatest ship ever built, Hringhorni, which was later used as the funeral pyre after the god’s tragic death. Relating to this deplorable incident, Balder was mistakenly killed by Höðr, Balder’s twin brother, who was also blind. Höðr was presented a dart made of mistletoe by the cunning Loki, who knew that Balder was impervious to all living elements on the face of Asgard and Midgard, except for the seemingly harmless mistletoe (which Frigg, Balder’s mother, missed when making a plea to most living things when it came to causing no harm to her delicate son). So the dart – thrown jokingly at Balder (as was the habit among the Norse gods), directly pierced his heart and slew him, instead of bouncing off the god. Consequently, many of the grief-stricken Norse gods even tried to bring back Balder from the domain of Hel, but to no avail, and thus the wise god was lost to them on account of Loki’s cruel prank. The deity of war and heroic glory, Tyr (or Týr in Old Norse) was regarded as the bravest of the Norse gods of the Germanic people. And in spite of his association with wars – more specifically the formalities of conflict, including treaties, his origins are rather enigmatic, with the deity possibly being one the oldest and most important of the ancient Germanic pantheon, until he was supplanted by Odin (who had been described in many myths as Tyr’s father, while other stories place Tyr as the son of the giant Hymir). In any case, since some of the aspects of Tyr related to formalities, the god was also hailed as the deity of justice and oaths. Tyr was often depicted as the one-handed god since his limb was bitten off by the monstrous wolf Fenrir when the god tried to trap the creature (and Fenrir was thus successfully bound till Ragnarok due to the sacrifice of Tyr). In spite of this episode, Tyr is foretold to be slain by Garm, the guard dog of Hel, as opposed to Fenrir (according to the prose version of Ragnarök). And like some other Norse gods, Tyr also has his significance in our modern day context. In that regard, the Old English variant of his name is Tiw, and he was associated with Mars by the Romans, and thus dies Marti (Mars’ Day) came to be known as tiwesdæg (Tuesday). As for the Norse god’s historical counterparts, there are a few candidates other than Bragi Boddason mentioned in various Poetic Edda pieces. The names include Bragi son of Hálfdan the Old (mentioned in Skjáldskaparmál) and Bragi Högnason (mentioned in the second part of Helgakviða Hundingsbana). Represented as having qualities somewhat akin to the chaotic and mischevious aspects of ancient Egyptian god Set, Loki is regarded as the trickster among the Norse gods, who as a jötunn (being the son of giants Helblinde and Býleistr) also possesses the power to shapeshift. Essentially, he is projected as an entity who is not entirely evil in his whimsical purposes, and yet particularly scheming in his cruel actions – many of which lead to misfortunes and even tragedies (like the accidental death of Balder). Now given his heritage as an outsider among the Æsir tribe of gods, the narrative of Loki in ancient stories might have served as a plot device that provides a soft antithesis to the other gods. His complex relationship with other gods, particularly Thor, comes to light from different sources. For example, in Lokasenna or “Loki’s quarrel” (one of the poems of Poetic Edda), Loki keeps on insulting Thor and then goes into hiding fearing the hammer Mjölnir. On the other hand, in Þrymskviða (or anglicised as Thrymskvida), Thor and Loki share their camaraderie when they together hatch a plan to retrieve the stolen Mjölnir from a jötunn named Þrymr. However, in spite of Loki’s complicated character and narrative, he is foretold to be responsible for the deaths of many Norse gods during Ragnarok. For example, Loki’s son, Fenrir the Wolf will kill Odin, while his other offspring, Jörmungandr the Serpent will poison Thor (that would ultimately lead to the thunder god’s demise). We tend to associate hell with the realm of eternal damnation. Well, its Germanic counterpart was no walk in the park either, with inhabitants like Fenrir the Wolf, Jörmungandr the Serpent and other subjects who had died through sickness and old age. The ruler of this netherworld (also called Helheim) was the eponymous Hel, who was the daughter of Loki and the giant Angrboda. And it fell upon her to judge and decide the fate of the souls who entered her realm. 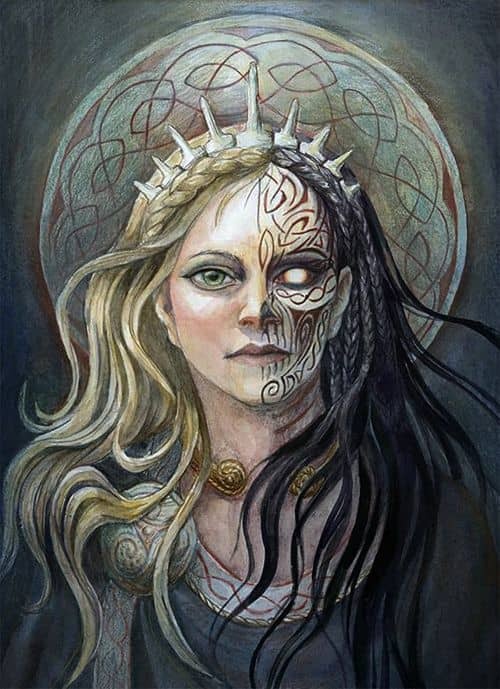 Descriptions of Hel, the being, have been found in numerous Viking sagas and poems; and most of them portray her as being partly decomposed with a face and a body of living women (albeit with a gloomy, downcast appearance), but with thighs and legs of a corpse. Still, among the Norse goddesses, she was said to be most powerful, even more than Odin himself, inside her own realm the Hel. 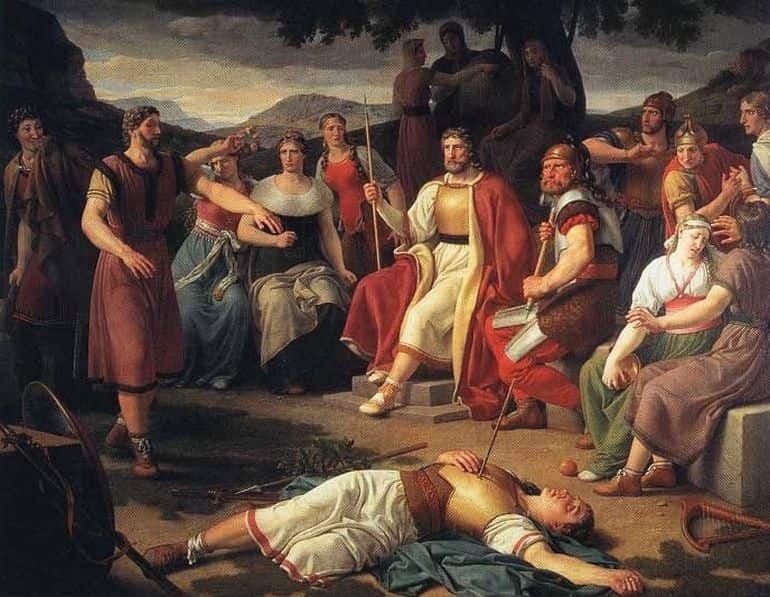 The tragic episode of Balder’s death confirms such an association to power since it ultimately falls upon Hel to decide the fate of the soul of a god who was considered the wisest and most pure of all the Norse gods of Æsir. Often portrayed as ever-vigilant guardian of Asgard, the stronghold of the Æsir Norse gods, Heimdall (or Heimdallr in Old Norse) was hailed as the descendant of giant Fornjót, and the grandson of sea jötunn (singular of jötnar) Ægir. He is often depicted with his horn Gjallarhorn (‘Resounding Horn’), which is put to use when intruders approach the home of the Æsir tribe of gods. Pertaining to this ‘guarding’ duty, Heimdall is attested to possess keen eyesight (that stretches to hundreds of miles) and hearing (that even encompasses the sound of wool growing on the sheep), complemented by other qualities like having foreknowledge and vast sources of energy (that allows him to sleep less than a bird). Interestingly enough, there is a possibility that Heimdallr was once considered to be the father of humankind, as vaguely mentioned in the Old Norse poem Völuspá. Other scholars have hypothesized that Heimdall as a figurehead was historically perceived by the Norse tribes as being responsible for creating the hierarchy and classes among men. 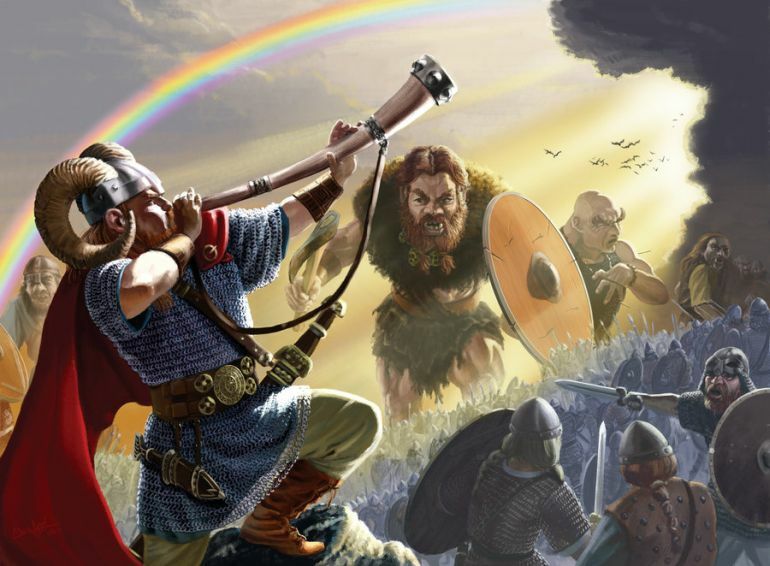 In any case, reverting to mythology, Heimdall also plays an important role in the impending Ragnarok, where he will sound the dire call of Gjallarhorn to signal the arrival of the giants and monsters. And in the consequent confrontations, Loki and Heimdall are foretold to slay one another. One the most venerated and beloved of the Norse gods, Freyr (along with his twin sister Freya) was unique in his origins, since he belonged to the Vanir tribe of Norse gods, as opposed to the Æsir. Usually depicted as a brawny man with his flowing hair, Freyr, the son of sea-god Njord (and frost giantess, Skadi or Njord’s unnamed sister), was hailed as the foremost of deities when it came to the aspect of fertility – covering both sexual and ecological scopes. 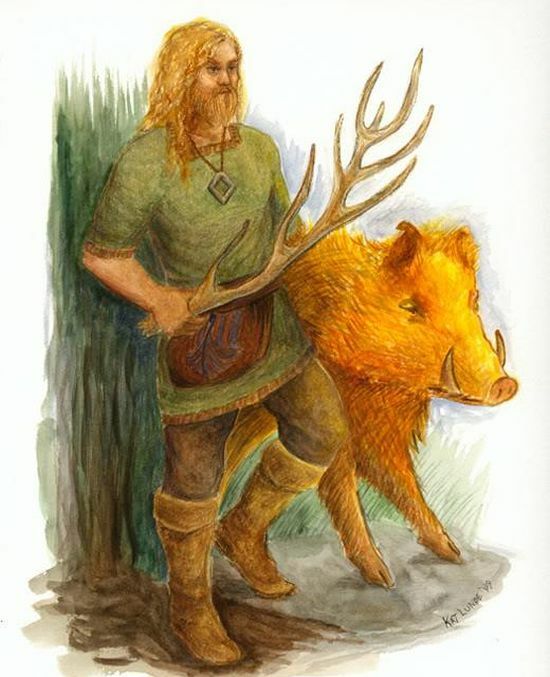 Simply put, the god embodied bountiful harvests, wealth, peace, and possibly even virility – all symbolized by Freyr’s boar Gullinborsti (‘Golden-Bristled’). Given his association to such important avenues, Freyr was the favored entity of reverence and worship when it came to marriage rites and harvest celebrations. The preferred sacrifice in these cases often involved the boar, the animal symbolically linked to the fertility god. 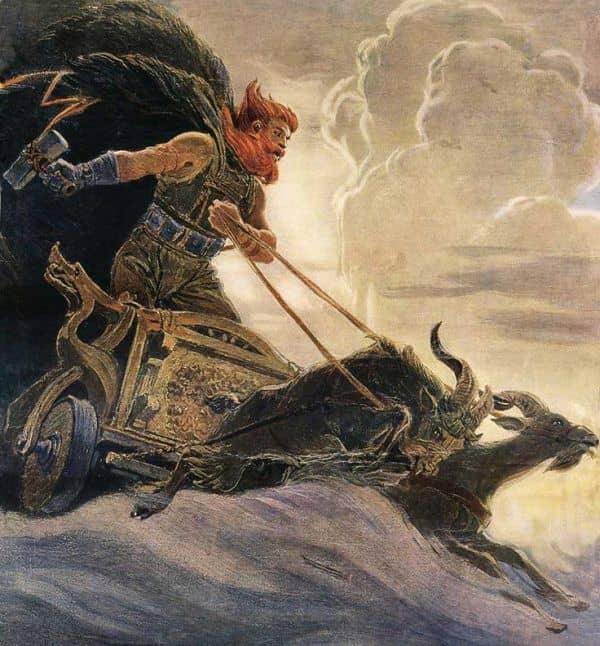 In that regard, in Norse mythology, Freyr was also known to travel in his chariot pulled by boars – and this was enacted by ancient historical processions of Germanic priests who went around in chariots (containing Freyr’s statue) to typify the coming of ‘peace and prosperity’ in various regions of Germania. Interestingly enough, Freyr was also associated with the elves, since his residence pertained to Alfheim, the homeland of the elves. 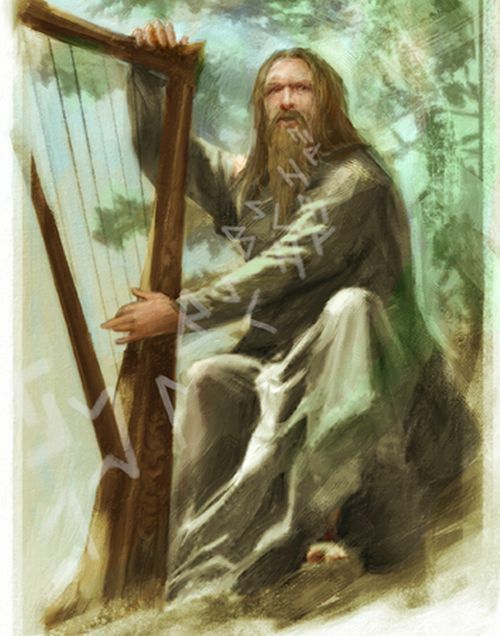 In that regard, some scholars have hypothesized that Freyr was possibly even regarded as the king of elves with immense riches – though such a conjecture is not well established in the Norse lore and actual historical sources. Moreover, Freyr also boasted his ship, Skíðblaðnir, which had the enviable capacity to always have a favorable wind, while also showcasing its ‘modular’ design that allowed the craft to be folded into a tiny package. Freya (Freyja in Old Norse, meaning ‘Lady’), though initially belonging to the Vanir tribe of Norse gods (like his twin brother Freyr), was also as a loyal and honorary member of the Æsir, after the conclusion of their tribal war. Epitomizing the aspects of love, beauty, and even opulent objects, the goddess was often represented as the seeker of pleasure and the unknown. Focusing on the latter, Freya embodied the völva (or anglicized vala), the female seer of the Norse religion who had the ability to tinker with the seidr – magic pertaining to destiny and its ‘weaving’. 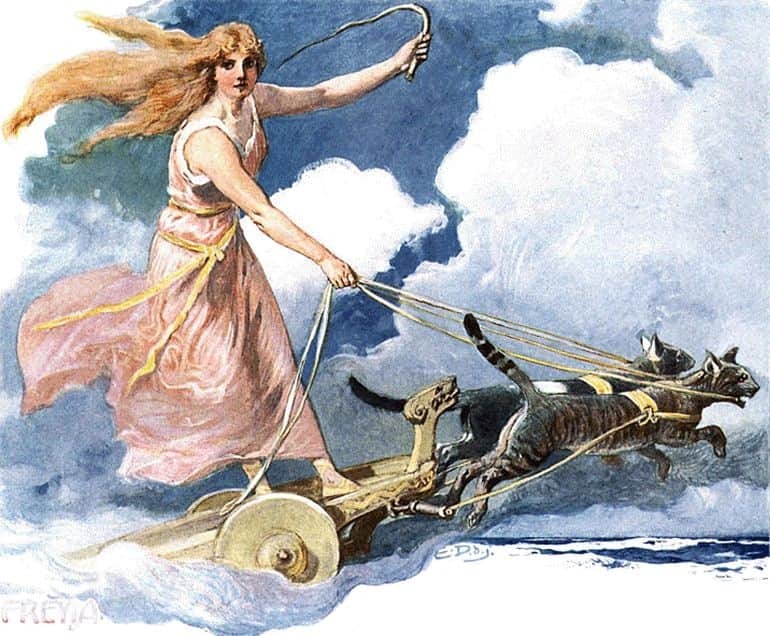 In essence, Freya had the ability to alter and manipulate one’s desire and fortune – and thus was often associated with the undiscernable attitudes of cats. Freya was also regarded among the Norse goddesses as the ruler of afterlife realm Folkvang, which allowed her to choose half of the warriors who were slain in battle (the other half were guided by the Valkyries to Valhalla – see the Bragi entry). All of these characteristics of a potent völva mirrors the historical scenario of the Germanic pantheon, especially during the Völkerwanderung or ‘Migration Period’ – circa 400-800 AD. In that regard, these tribal societies tended to favor two gods at the head of their pantheon symbolizing the chieftain warrior (who would lead them into battles and plunders) and his wife the prophetess (who would outline the future outcome of such military encounters by her magic). 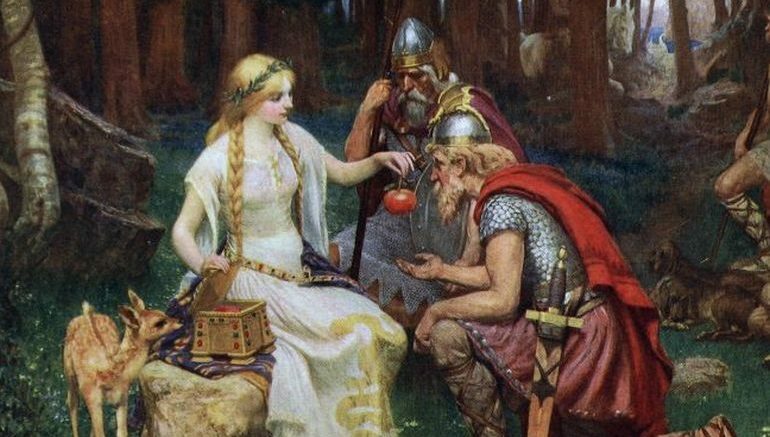 Many historians and scholars believe that these two figures eventually coalesced into what we know as the Norse entities of Odin and Frigg, with the latter being the same (or at least sharing similar qualities to the) deity who was regarded as Freya. To that end, Freya’s husband is often identified as Óðr, roughly meaning – furor or ecstasy. And Óðinn – the Old Norse for Odin, is just the word óðr with the masculine definite article (-inn) added to the end.